Caption slip reads: "Photographer: (Israel consul took picture). Date: 11-09 (?). Reporter: Bernstein. Assignment: Julius Fligelman. 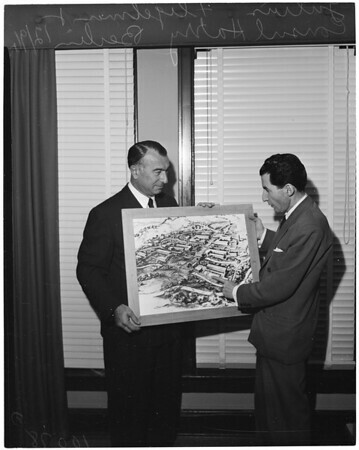 5-6, from left: Julius Fligelman, campaign chairman for Technion School in Israel & L.A., manufacturer, inspects artist's sketch of proposed new buildings of Technion, with Israel consul, Harry Beilin."